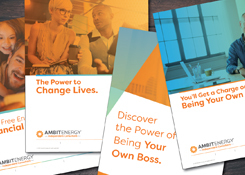 Ambit Energy’s Marketing Team has created two new sets of ads for our U.S. Consultants. One is aimed at reaching new Customers; the other is designed to help you reach potential Consultants. Both can be found on PowerZone under the Tools icon on the “Advertising Page” in a downloadable Zip file. “These new ads are designed with the needs of our Consultants in mind,” says Eric Johnstone, Ambit’s Vice President of Marketing and Field Services. “They’re available in both color and black-and-white, and in a variety of sizes.” The new ads are also compliant with Ambit’s brand standards. “Our team created these materials to be user-friendly, meaning Consultants can purchase space and use them in a program for their kid’s sports team or performance group, in a community directory, the local paper or just about any publication you can imagine,” Johnstone says. The ads can also be used as flyers for distribution at Business Presentations and other Ambit events. The ad templates are ready to be downloaded immediately and provided to any publication or your local print shop. All the Consultant has to do is open the pdf, enter their personal information and send the file to the publication. Complete details on how to use the ads is available in the Ambit Energy Brand Guidelines, also available on PowerZone. If you have any questions, please email marketingteam@ambitenergy.com.